Dragonz by Microgaming is the newest game by the gaming developer. This new slot was announced recently, and it has just made it to the online gaming market. As the title of the game implies, the game has a dragon theme. As players enjoy that great theme, they will also be able to enjoy a highly rewarding and a fun gaming experience that is like none other. This is because the game offers 4 different free spins round, scatter pays and a wild icon. In addition to the rewards, he game has fluid and crisp 3D visuals and animations. 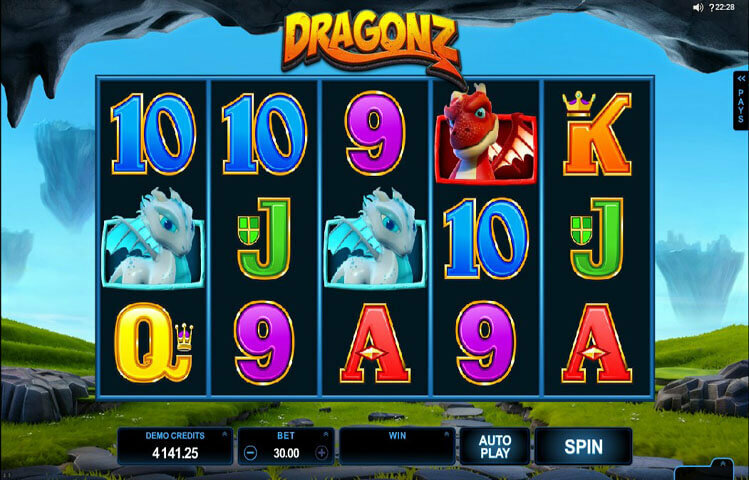 Dragonz by Microgaming comes with a dragon theme. Therefore, players can expect to be taken to the world of dragons as they join 4 dragons during the game play. These four dragons are entitled Frost, Switch, Gobble and Flint. Each dragon has a different color that is related to his abilities and the features he can trigger. So players better be ready for an awesome dragon experience in the land of dragons with these 4 main characters. The game has a 5 reeled setup that hosts 243 ways to win. This paying format is much better than the line based format. This is because instead of being limited to a small number of lines, players will have 243 chances of winning with every spin of the reels. Dragonz would manage to attract players and captivate them from the moment they open the game. This is because the game has 3D crisp and fluid animations and visuals. Therefore, players would expect a visually satisfying gaming experience that will always have the coming back for more. This starts with the background of the reel that is presented in high quality visuals. Players will see nothing but the calming green fields and the blue sky. As for the icons that appear on the reels, they include the 4 dragons that come in 3D icons. There is also the wild emblem as well as the scatter gem. All icons can turn into animations whenever they are a part of a winning combo. Dragonz, being powered by Microgaming, comes packing many special features. They all begin with the wild icon, which will increase the players’ winning chances drastically. This is because it would replace all other icons, except the scatter gem, to help players grab a prize. Also, any non winning spin with a wild on the 3rd reel will trigger the Wild Deal. Extra wilds will be dealt to the other reels for a guaranteed win. The other special icon, the scatter gem can trigger one of 4 different free spins round. Each round has its own main dragon that affects the feature. There is the Free Spins with the flaming wilds, with the frosty wilds, the winning wilds and the stashed wilds.